Gift giving can be fun but it can also be daunting. You’re faced with questions like “How much should I spend?” and “How much can I afford to spend?” as well as “What do I get you?”. These questions are made all the more difficult if you don’t know the person that well (ex. secret santa at the office) or have a tiny budget to work with. 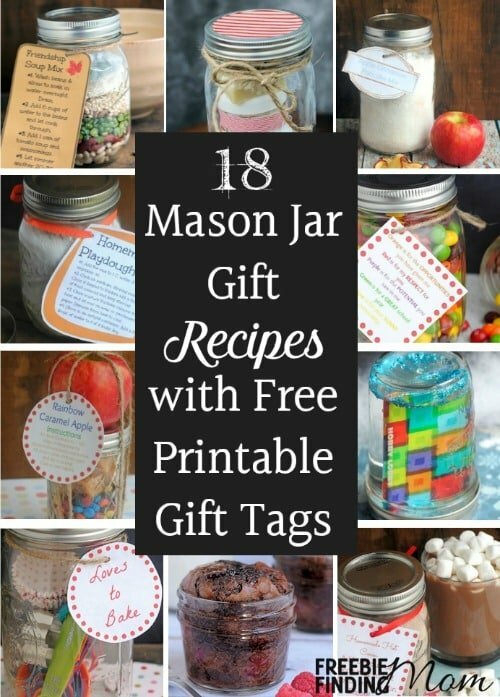 This is where Mason jar gift recipes come in handy. Mason jar recipes should check off just about every box on your list. They’re inexpensive, quick and easy, fun, and (here’s a big one) thoughtful. 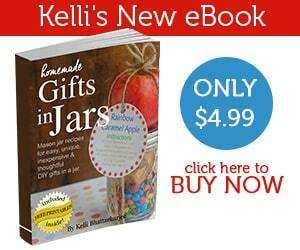 Yep, these DIY gifts in the jar are a little more personal than many store bought gifts. 1.) 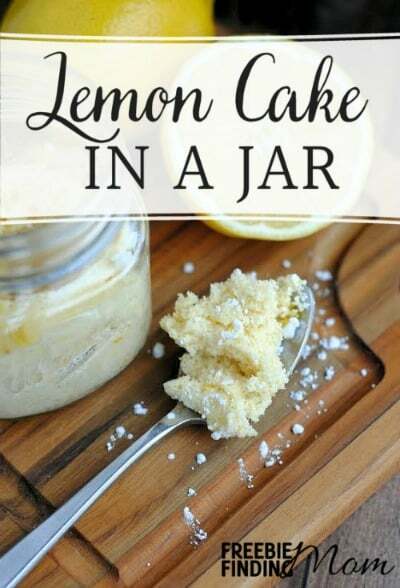 Lemon Cake in a Jar Recipe – This Mason jar recipe makes a great gift to yourself. Hey, you work hard, you deserve a treat… right? This single serving lemon cake is easy and delicious making it the perfect thing to sooth a sweet tooth. 2.) 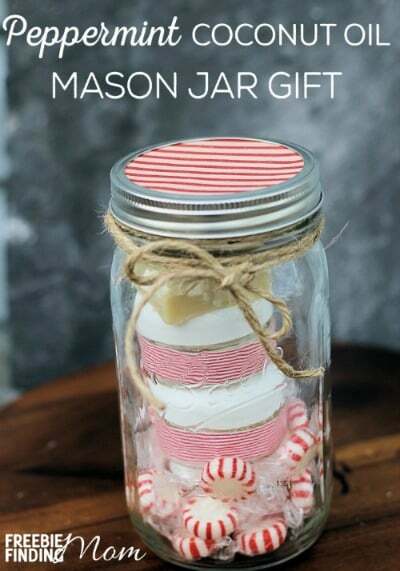 Peppermint Coconut Oil Mason Jar Gift – Looking for DIY gifts in a jar that aren’t edible? Look no further. This jar is filled with peppermint scented homemade goodies like lotion bars and body scrub. This Mason jar gift recipe requires a little more time than others (because its a combination of multiple recipes) but it’s worth the work! 3.) 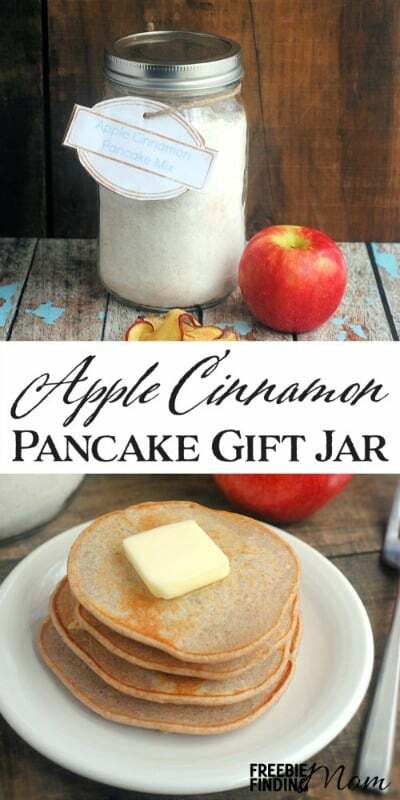 Apple Cinnamon Pancake Mix Gift Jar – Give somebody the most important meal of the day with this Mason jar recipe for tasty pancakes. It’s great for just about anyone in your life from friends to coworkers. 4.) 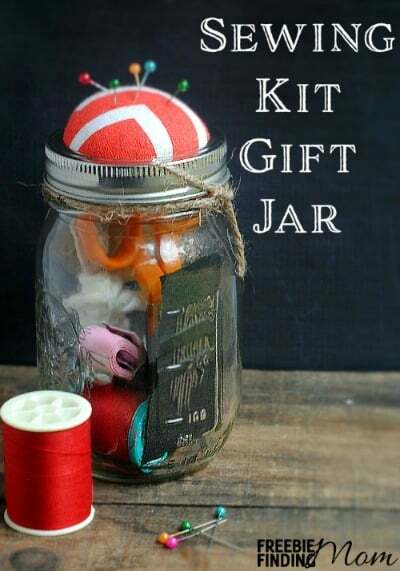 Sewing Kit Gift Jar – This cute DIY gift in a jar is pretty and practical. It is also highly customizable. You can choose colors for the pin cushion top that match the receiver’s decor or reflect the receiver’s favorite color. In addition, you choose what to include (ex. different color threads). The fact that this gift is so customizable makes it something you can really get creative with. Have fun! 5.) 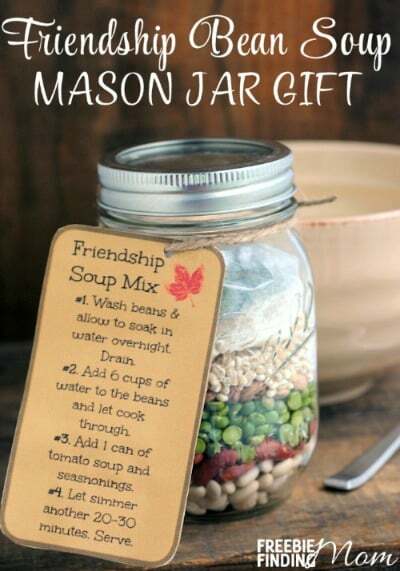 Friendship Bean Soup Mason Jar Gift – Mason jar gift recipes are great for any occasion… even “get well soon” gifts. I think this particular recipe is perfect for someone under the weather. After all, how could hearty delicious soup not make you feel better? 6.) 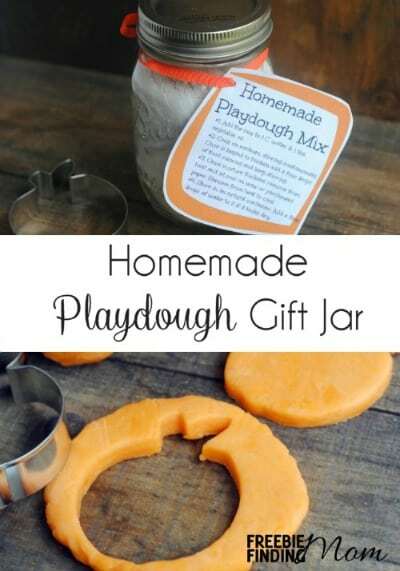 Homemade Playdough Mason Jar Gift – Looking for a gift for a child that doesn’t involve batteries? Look no further. This Mason jar recipe for homemade Playdough is easy to whip up and sure to be a hit with the little receiver. 7.) 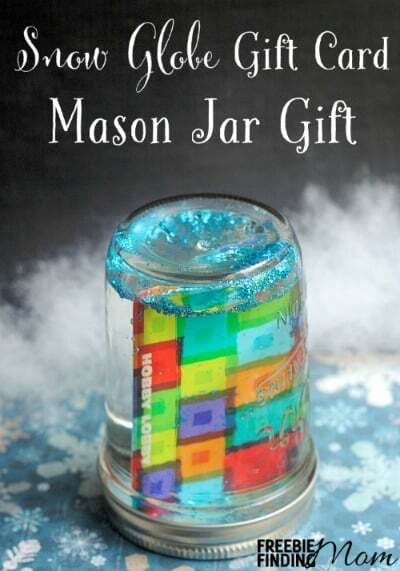 Snow Globe Gift Card Mason Jar Gift – When you absolutely do not know what to get someone the best answer may simply be a gift card. However, you don’t have to just hand someone a plain old piece of plastic…dress it up with DIY gifts in a jar like this. This easy craft project makes even a gift card seem thoughtful and special. 8.) 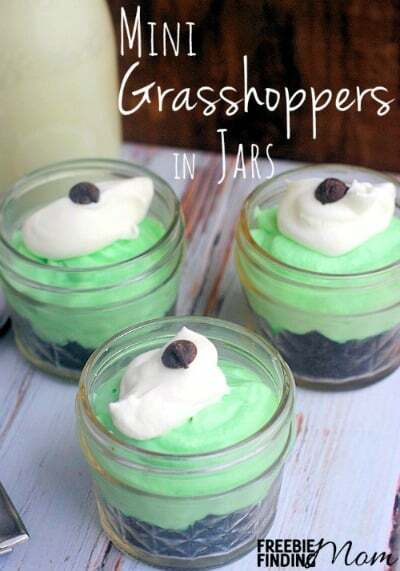 Mini Grasshoppers in Jars – Looking for an unusual sweet treat to serve at your next gathering? Try this Mason jar recipe for mini grasshoppers. Customize this dish to fit any occasion by swapping the optional green food coloring for a different color. 10.) 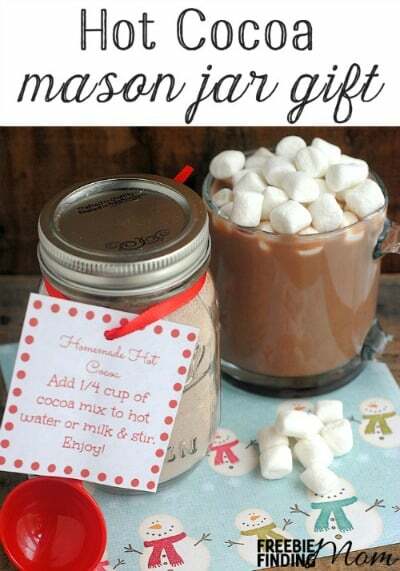 Hot Cocoa Mason Jar Gift – This Mason jar gift recipe is sure to warm someone’s heart and body. This is the perfect gift for occasions that fall during the colder months including Christmas. Add a pop of color by choosing colored marshmallows to top the jar off. 11.) 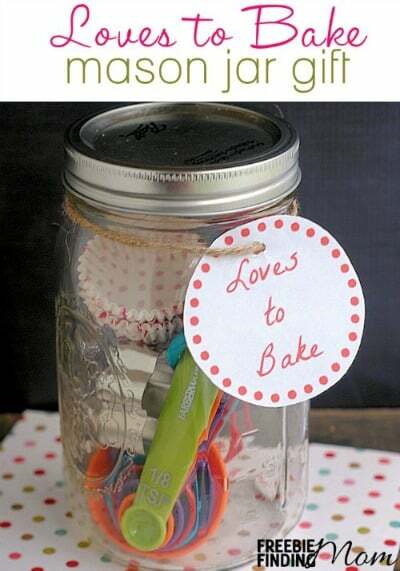 Loves to Bake Mason Jar Gift – DIY gifts in a jar like this are a lot of fun to put together. Trust me, you’ll have a great time shopping for all the little baking goodies to fill this jar. This gift is really great because you can give it to multiple people and have each jar look quite different by using different fillers. For example, put a different mini cookie cutter in each one. 12.) 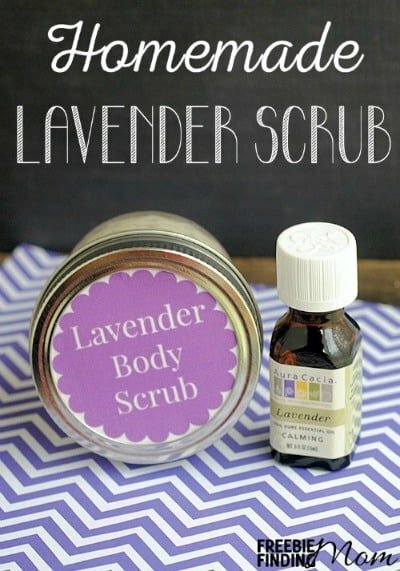 Homemade Lavender Body Scrub – Wish you could give that special someone a day at the spa but can’t afford the high price tag? 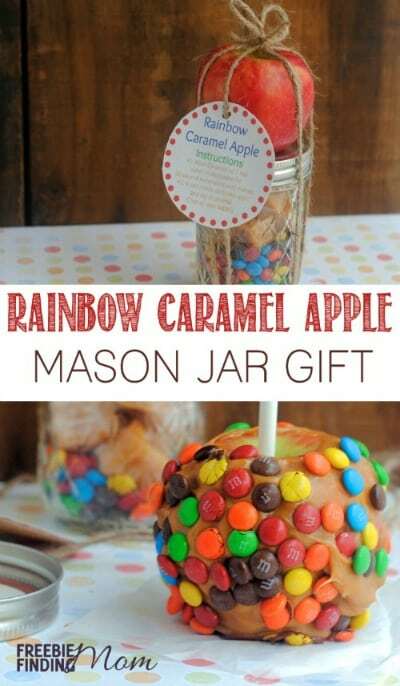 Give the gift of relaxation and rejuvenation with Mason jar gift recipes like this one. This gift will let the lucky receiver enjoy a refreshing visit to the spa on demand. 13.) 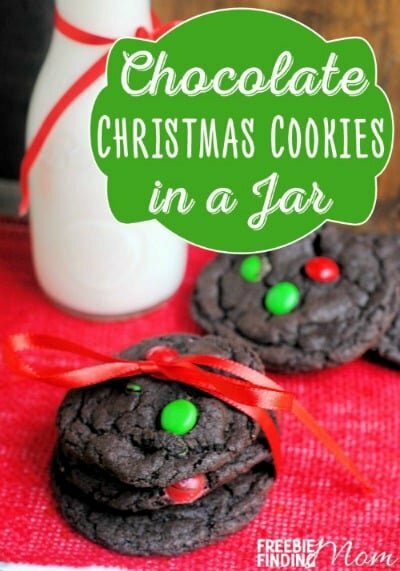 Chocolate Christmas Cookies In A Jar – Despite what the title says, this Mason jar recipe doesn’t just have to be for Christmas. These cookies are delicious year round and are sure to be appreciated (and gobbled up) by the receiver. 14.) 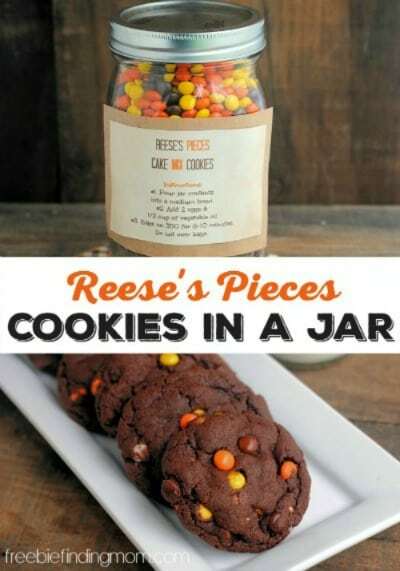 Reese’s Pieces Cookies in a Jar – Peanut butter and chocolate blended together — need I say more to convince you how wonderful this Mason jar recipe is? I think not! 15.) 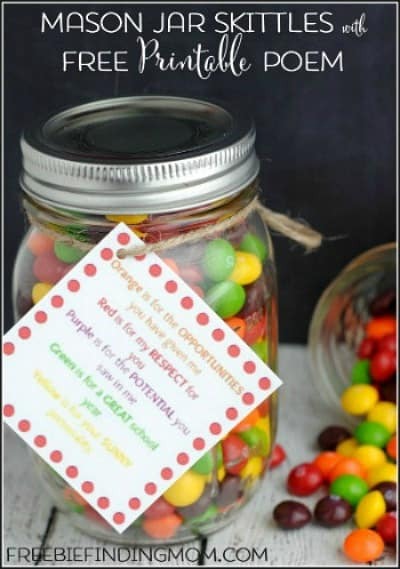 Mason Jar Skittles with Free Printable Poem – While this DIY gift in a jar was originally created to honor educators (for teacher appreciation week), if you tweak the printable poem (remove references to education) you could use it for anyone. Heartfelt and as easy as they come it’s another great option for a last minute gift. 16.) 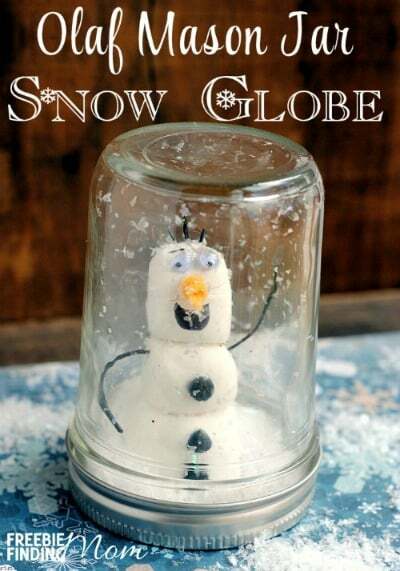 Olaf Mason Jar Snow Globe – Of all the Mason jar gift recipes in this article, this one is probably the most complex. Yes, it requires a little skill but it is the perfect option if you have a fan of the movie Frozen on your hands. Take your time and as always, have fun and you’re sure to wind up with a great gift. 17.) 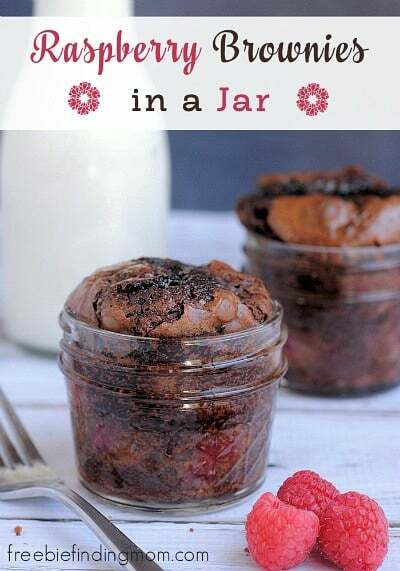 Raspberry Brownies in a Jar – How does a decadent chocolate treat without the guilt sound? Pretty darn good right? Too good to be true? Well, it isn’t. This Mason jar recipe gives you a yummy raspberry brownie that is sure to satisfy your sweet tooth while keeping your waistline in mind. 18.) 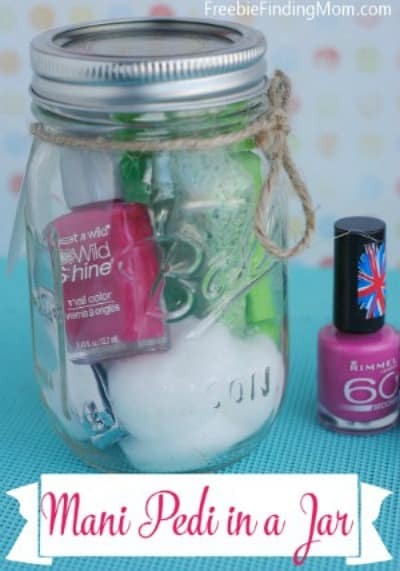 Mani Pedi in a Jar – This Mason jar recipe is perfect for ladies of all ages. Simply make it age appropriate (and tailored to the person your giving it to) by swapping out the nail polish colors. This is a fun party favor for bachelorette parties, wedding showers, etc.